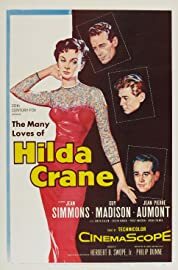 Hilda Crane (1956) | Khaanflix | Watch Latest Box-Office Movies Online for Free! After two failed marriages, a disillusioned woman returns to her hometown to start life anew. Director Philip Dunne's 1956 drama stars Jean Simmons, Guy Madison, Jean Pierre Aumont, Judith Evelyn, Evelyn Varden, Peggy Knudsen and Gregg Palmer.